[v0.6] Teleportals ~ Teleport anywhere in your world! Hello everyone, I've making a new W.I.P mod called Teleportals. Everything is based on a idea from The_Pastmaster. 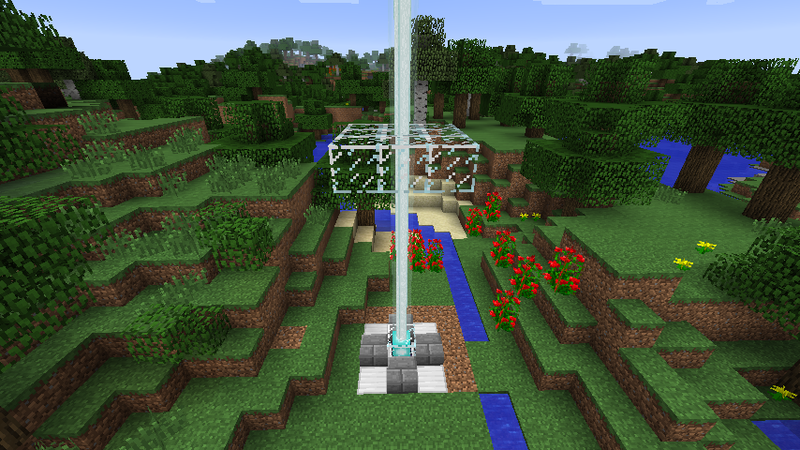 This simple mod allows you to teleport anywhere in your world, using portals made from vanilla Minecraft blocks. The basic portal allows you to travel to any other basic portal that's lined up with it within 50 blocks. They are also chainable, meaning you can place multiple portals down, and be automatically teleported to the next one. Make a hollow 5x5 frame made up of emerald blocks, and right-click the bottom-middle block with a emerald block to ignite it. The advanced teleportal allows you to travel to any other advanced portal with the same corner-block combination as the first one. They have infinite range, and doesn't matter which direction they face. If you have more then two portals down with the same corner-block combination, you will be randomly teleported between all of them. Make a hollow 5x5 frame made up of emerald blocks, and right-click the bottom-middle block with a diamond block to ignite it. Be sure to change the four corner-blocks to whatever you want the combination to be! * = Modifiable through the config file. The focal lens can extend the range of the basic portal by fifty* blocks. The lens can be up to fifty* blocks away from the first portal, and the second portal can be up to fifty* blocks away from the lens. 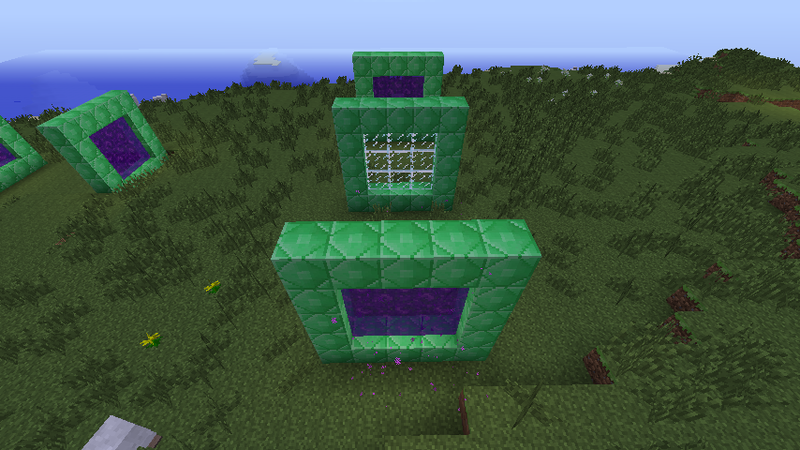 Create a 5x5 frame of emerald blocks, then fill it in with glass panes. Make sure the lens is in the same path as the two portals, otherwise it won't work. This mod also allows you to teleport using a beacon. Setup a beacon that it giving off the light beam, then place a glass platform above it. 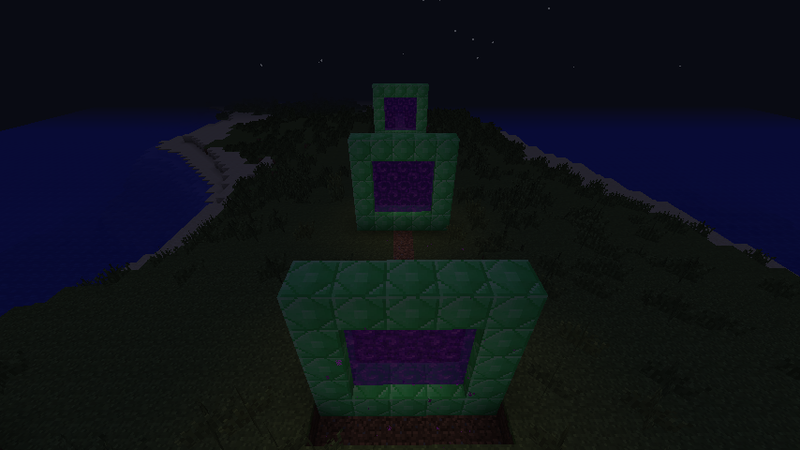 Once you step onto the beacon, you will be automatically teleported to the platform, with a range of 75 blocks*! Note: You don't need to have those half-slabs next to the beacon, I just put them there so it's easier to step onto the beacon. So long there is a glass platform above an active beacon, it'll work just fine. -Fixed advanced portals not teleporting you correctly when placed along the X-axis. -Basic portals now teleport you to next portal (not the farthest one). WARNING: This is a work-in-progress mod. There may be bugs, glitches, and other unintended stuff. If you find a bug, please post it in this thread. It's a fairly simple mod, but I really like it, and I hope you do too! Thanks for making it, Gforce. I sent you some bugs to fix. As always, if you find any bugs, be sure to let me know. Thanks! I think that 1 diamond block to activate a portal is a bit too expensive. It would be nicer if the diamond block would be used as a tool of some sort to light it or it you had some cheaper way to light the portal if it will stay as a 1 time use igniter. -Added the ability to change the corner blocks in the advanced portal's frame without having to re-light it again. -Added Forge mod info (for use in the Forge mod list). The advanced portal is worth the price tag in my opinion with the new functionality which was planned from the start. The ability to change the combination on the fly. So now from just one advanced gate you can travel to all other advanced gates as long as the combination matches. -You now face the correct way when exiting a advanced portal. -The basic portal and lens' range is now modifiable through the configuration file. It seems that this mod has been out for a little while and I only just found it. Posts can get lost very easy on the forums here. Any way I want to say great job on the mod and thanks for making it. I think emeralds were the perfect choice for this mod. Looks really good. We can always use more teleportation mods. I like this mod. It's nice and simple, but also useful. So many teleportation mods I see either have rather complex gui's or tend to rely heavily on coordinate-insta-porting. It's nice to see a change. So, do the corner blocks all have to be the same, or can they be of any combination of block-types? Any combination. Think of it as a code lock. At least two portals has to have the same code to allow travel between one another. I've confirmed that method does exist in the class file, it has a client only annotation and is being run on the server, but I haven't tracked that back yet. Sorry about that! I'll be sure to fix that in the next update! Thank you for this mod. One of the most useful ever. 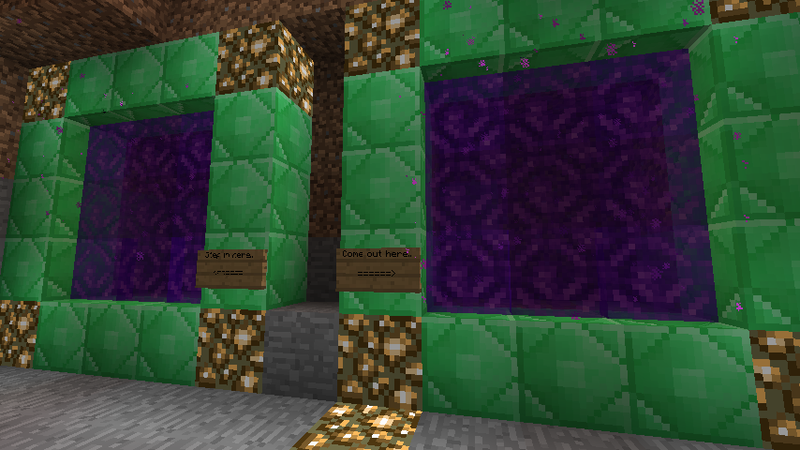 With this mod installed, server will crash upon anyone returning from the nether. Even though I'm playing single player off line it crashes game and then brings me to the multiplayer server list screen even though I was never using multiplayer or enabling local lan. 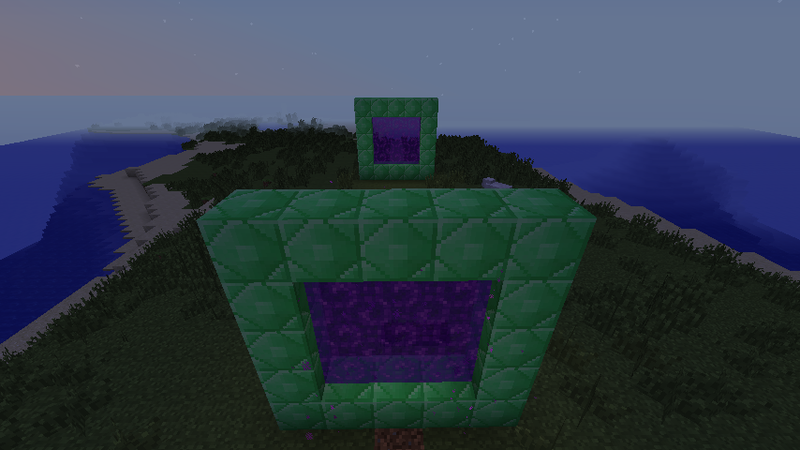 Two recommendations: Be able to use these portals in the nether via nether only, and it would be cool if these portals could be made horizontally too. Again, thanks for this mod. I had to register on account of this one. It's too good!!! Sorry about the crash, it's due to the new way of sending packets in Forge v10.12.2.1125+. I'll be sure to fix that really soon! ^ Updated to Forge v10.12.2.1145. +Added beacon beam teleportation feature (check out the OP for a description). +Added in-game configuration screen (found by clicking on the mod in the in-game Forge mod list). Note: If the in-game config screen isn't saving custom setting correctly, delete the old teleportals.cfg file in .minecraft/config, and let Forge generate a new one. Works a charm now. Thanks for update. I seem to be having problems with portals not working when the destination is in an unloaded chunk. Are they supposed to work with unloaded chunks or is the range limited to loaded chunks?